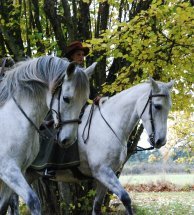 Maja has developed and is teaching ‘Riding Art of Life’ education. Maja is willing to travel for clinics in Europe and surrounding areas. A clinic where focus are on philosophy and the gymnastics of the horse, the balance, seat and ’embodied rider’. – 2×3 hours theory and Movement communication. – 2×3 hours lessons with horses. Body & awareness in the Riding Art of Life. I really love and appreciate deeply what this work have done to my self and do for my students. This clinic is without horses but is mostly valuable and loved among riders who really have understand that to really move with their horse they need to work with their own body & awareness. Dance, games, bodywork, contact and awareness in the body, finding the ‘openness of the body’ and the playfulness in OUR BODY FIRST first. Are you interested in a clinic? – You film yourself training your horse. Max 15 minutes. You put it with a private link on youtube. -We agree on a online meeting on Skype. – We meet at Skype and we look at your film at youtube at the same time. I teach and give you tips for your further training. -You transfer 90 euro before the meeting. Please send an email to mail@livsridekunst.dk to make an appointment for Distance video-lesson.